That’s a pretty cheap price for a rare breed animal. But, if your looking for love I guess it doesn’t matter. Lots of rescues around as well. 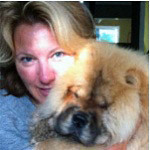 If your looking for purebred and reputable, perhaps a chow is out of your financial range. My colleagues have been burnt before. Could either be a mix breed passing off as pure breed, or just outright scam where they take your money and disappear. If it sounds too good to be true, it probably isn't.